This recipe is in memory of my grandmother, who would make this for most of our big family gatherings. I think she knew they were my favorite. I was pretty transparent about it as I would run into her house straight for the kitchen, barely a hello, looking for scallion egg piroshki (meaning “dough with filling” in Russian also known as a galette, in French) fresh out of the oven. It was my most favorite thing she would make. That and her crescent walnut cookies coated with tons of powdered sugar. Hers tasted a hundred times better than mine. Though she made it with gluten, that’s not what made it different. 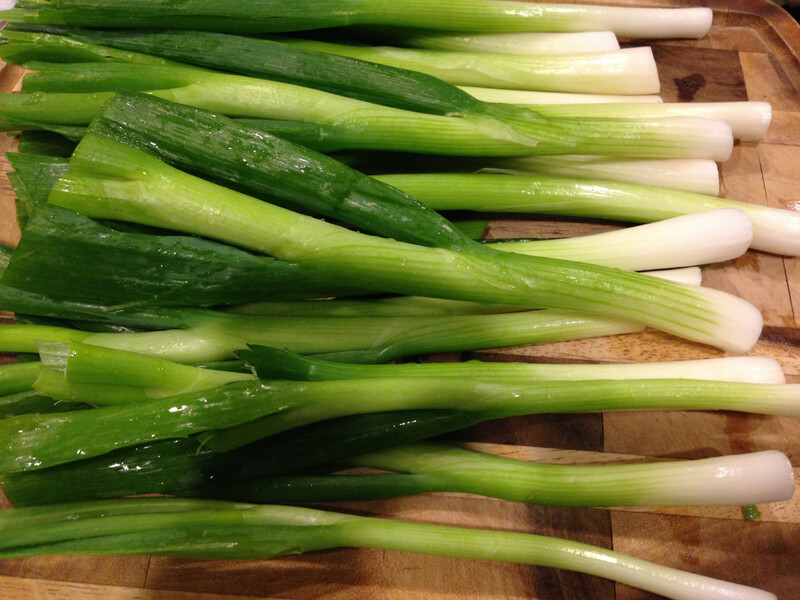 There was something she did with the scallions. They were always so incredibly soft and coated with egg. Nobody in the family has the recipe, unfortunately, so I had to settle for guessing. 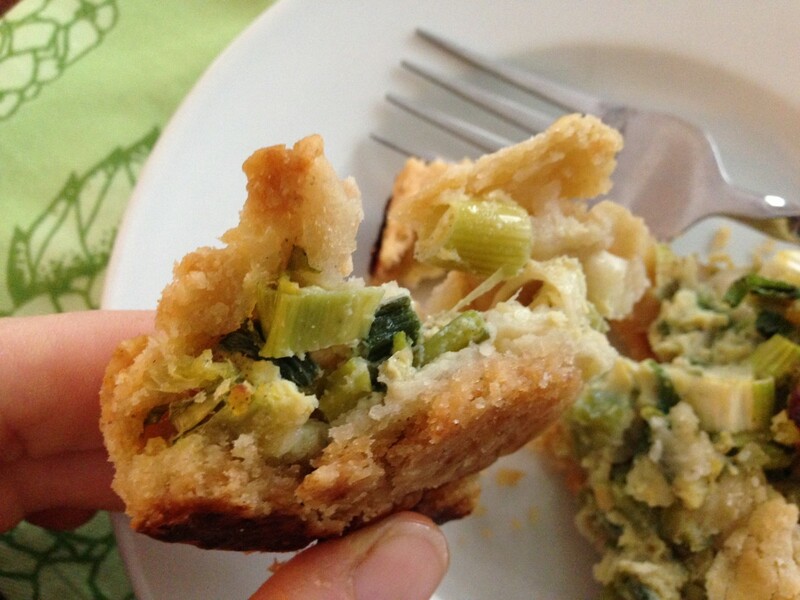 With her death anniversary being today I wanted to honor her with a rendition of her incredible scallion egg piroshki (I could eat it all day long) and share a little bit about my Babula (meaning dear, sweet grandmother in Russian). When I look back and remember my grandmother, whom I have always called Babula, the first thing that comes to mind is her in the kitchen. She was always in the kitchen. I’m not sure if it was because she loved cooking, or out of necessity to feed my grandfather, my mother, and three uncles; in addition to the whole extended family at every holiday (we are a big family!). She passed two years ago today from stomach cancer. Last year was just too hard to write anything. This year I felt compelled to do so as she has been coming into my dreams lately. Maybe a sign?Most recently, taking my hand to dance with me. I miss her, and think about her often. We didn’t have that grandmother-granddaughter relationship where we would go to the beauty parlor together, get our nails done, or chat away about boys or clothing. It was more of a practical relationship that I valued dearly. She would care for me in my adolescent days when my mother worked, give me words of wisdom when I became too rebellious, and used holistic treatments when I was sick (there was never any medicine in our medicine cabinets). She also taught me to sew, and shared her passion for gardening. She would also braid my hair, and tell me to always have my hair pulled back, and groomed with my head held high. These are the things I remember most. When I had my first child and needed to go back to work, she picked him up from preschool and took him to the park every day. But before that, she would prepare dumplings (what we call pierogies in Russian) from scratch because it was my son’s favorite. She was a hard working woman who worked in the leather business in Russia. Then immigrated to Israel, Italy, then America along with my grandfather, uncles, and my parents in 1973. Back then you couldn’t leave Russia and come straight to America, there was a 2 year process due to Russia being a communist country. In all her years in America she still didn’t speak much English. We spoke Russian to her the best we could. One Passover my husband (who isn’t Russian) made a toast, in English, complimenting her – she smiled and blushed. All was revealed. She did understand everything we were saying in English. Years later I understood she wouldn’t speak English so that my brothers, cousins, and I would speak Russian to her to retain the language. Ah, many memories that I will cherish. 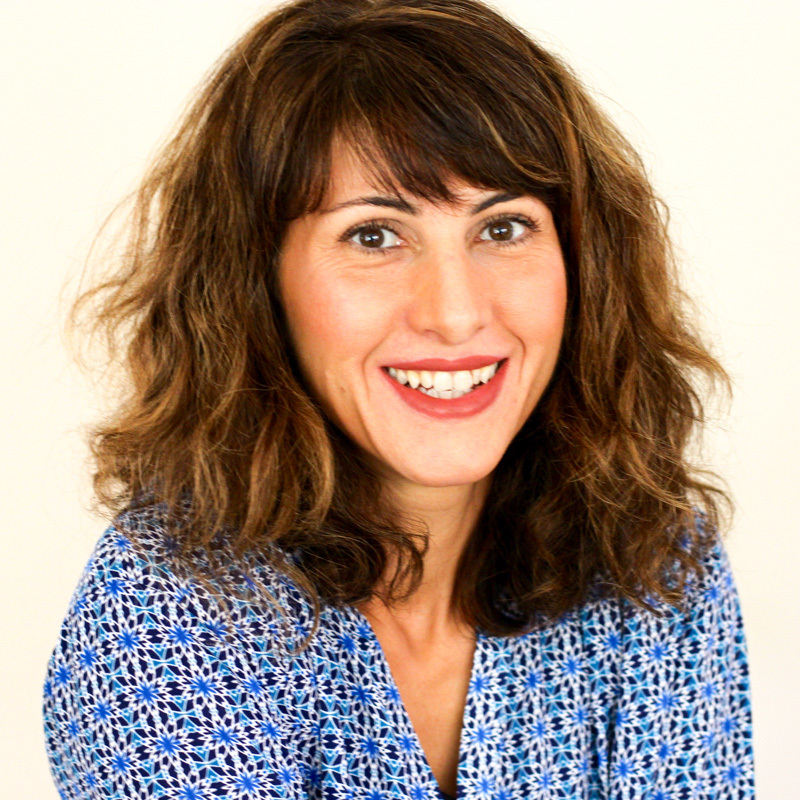 When she went into the hospital due to severe pain, they discovered she had stage 4 stomach cancer. My mother called me with the unimaginable news. Barely holding onto the phone, I felt a pang in my chest. I was stunned. Living in Los Angeles I couldn’t just come to NY to see her. Not with three children at home, two with special needs that need constant care. I did get to see her two months before, while visiting my oldest son at NYU, and she looked fine. I couldn’t believe a couple of months could lead to this. Just goes to show that every day is a gift. It broke my heart that I could not get into my car and just go to see her. I scheduled a flight for New York as fast as I could, after a scheduled IEP (goals made for a special needs student), and the completion of my teenage son’s 6th grade history project that I was working on with him. I figured a few weeks is not that long away. I asked my mother to call me during her next visit to my grandmother so that I can talk to her. At this point she was heavily drugged up with morphine, wasn’t talking, and barely moved. My mother called and I spoke to my grandmother. I told her how grateful I am for all her prayers, and for all that she has done for me and my family, and how much I love her. I selfishly needed confirmation so I asked her to move her fingers if she heard everything I said, and my mother told me she did. I then cried the rest of the night. I felt that was it. She passed away two days later before I arrived in NY. She was 81, a week before her 82 birthday. It was days before Chanukah, I remember frying latkes the day I got the call from my mother. Though I wasn’t there in her last days, I do feel blessed to have prepared food in her kitchen for shiva (a seven-day mourning in the deceased home where all the mirrors are covered, and the spouse and children of the deceased sit low to the ground in mourning), she loved feeding us. It is only after her passing that I realized how much family meant to her. How much wisdom she imparted. How much she prayed (including the recovery of my twin boys’ from autism), cared for my oldest when I was a single Mom and worked two jobs, loved her grand, and great grandchildren. And how she brought so many people into her home and welcomed them with an abundance of food and drink with a smile. I didn’t realize this in the midst of it all, but do now, now that she has passed. She was a force of nature. So, my dear friends, this pieroshki (odd for me to call it a galette) brings back warm memories of my grandmother. A recipe I hold dear to my heart that I wanted to share with all of you. I am working on making this one egg free, that’s still in the tweaking phase for my oldest son (her first great grand child) since we recently realized all his allergies symptoms are due to eggs. Knowing my grandmother she would have made one egg free especially for him. Though it’s not exactly like hers, it happens to be delicious with the soft, flaky dough I remember. I think she would be proud. Enjoy. 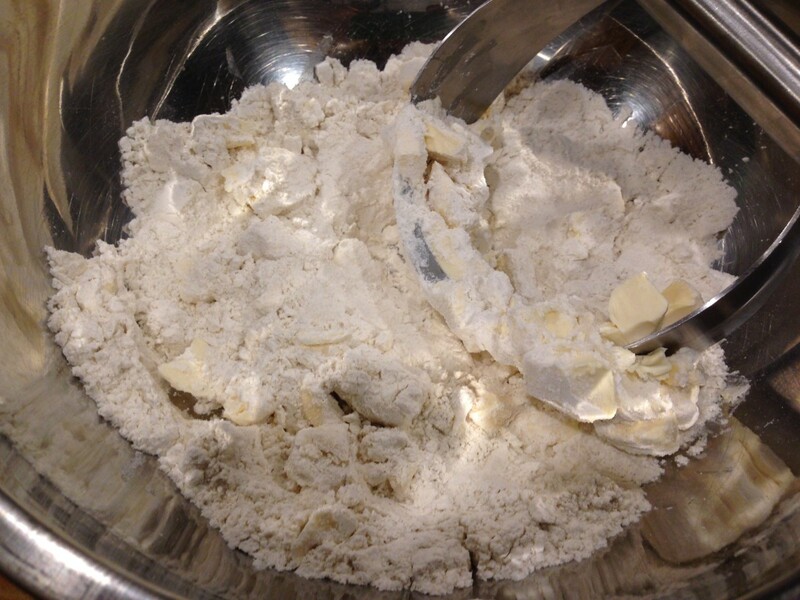 Combine flour, kosher salt, sugar in a large bowl. Add diced earth balance and mix into the flour blend with a pastry cutter until earth balance looks like large cereal flakes. Then continue to work the dough using your hands, kneading the dough. 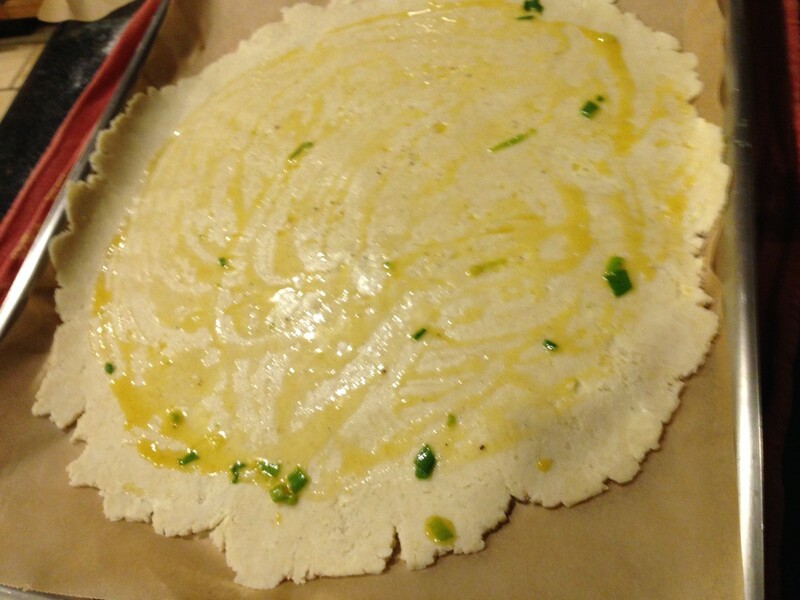 Shape the dough into a thick round disk, wrap in plastic wrap. Meanwhile, combine scallions, eggs, yolks, kosher salt, and pepper in a medium bowl, using a fork to break up the eggs, and mix well. In a skillet set over medium heat, add coconut oil. 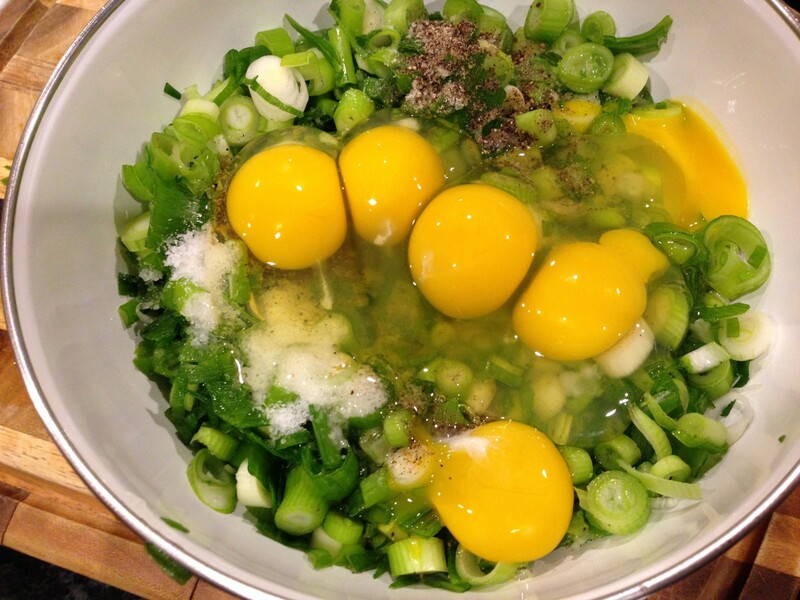 When melted, add scallion mixture and sauté until some of the liquid from the egg begins to scramble, removing about half the liquid. About 3-4 minutes. Set aside. 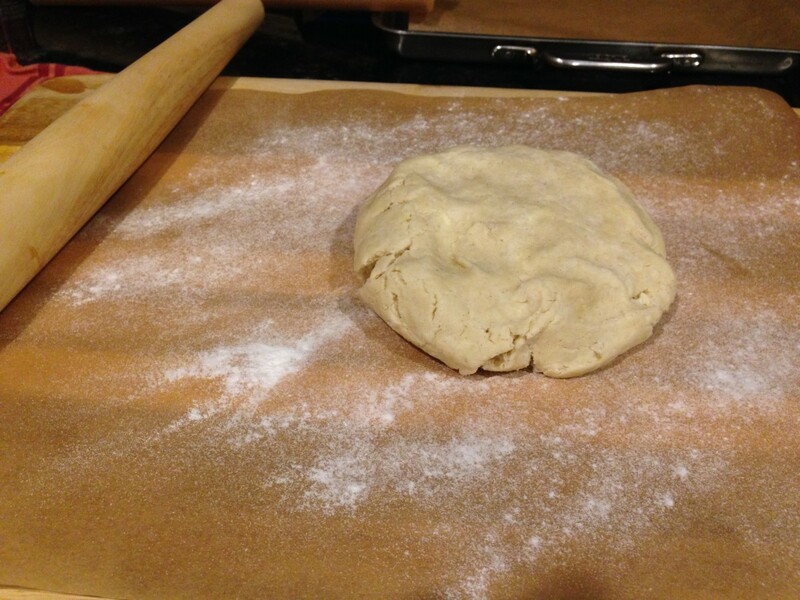 Place parchment paper onto a large surface and dust with white rice flour. 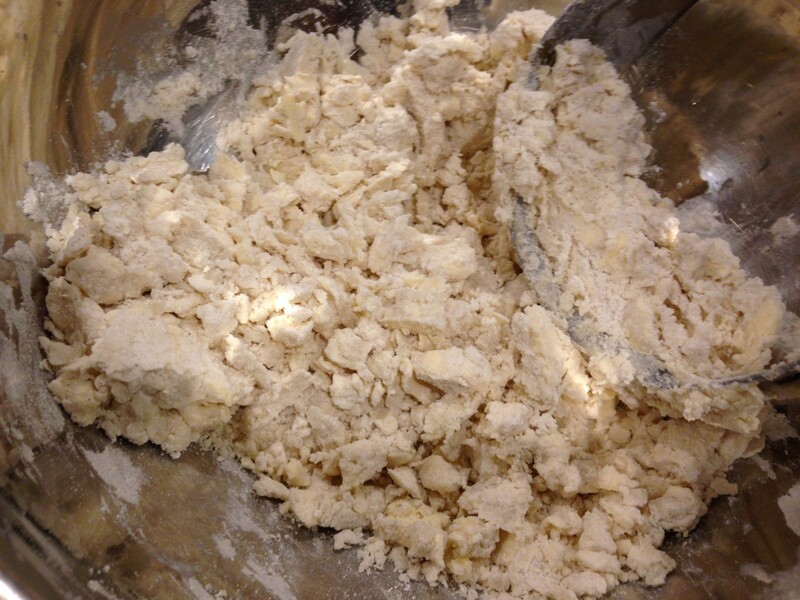 Place dough on floured paper then dust dough with a sprinkling of white rice flour, cover with parchment paper. Begin rolling out the dough in a vertical motion a few times, then horizontal a few times until you get approximately a 14 inch round crust. I roll it out to the edge of my precut parchment paper sheets. Note: Do not force the dough to spread, rather roll repeatedly alternating vertically and horizontally using gentle, but firm pressure to prevent the dough from getting tough or dense. 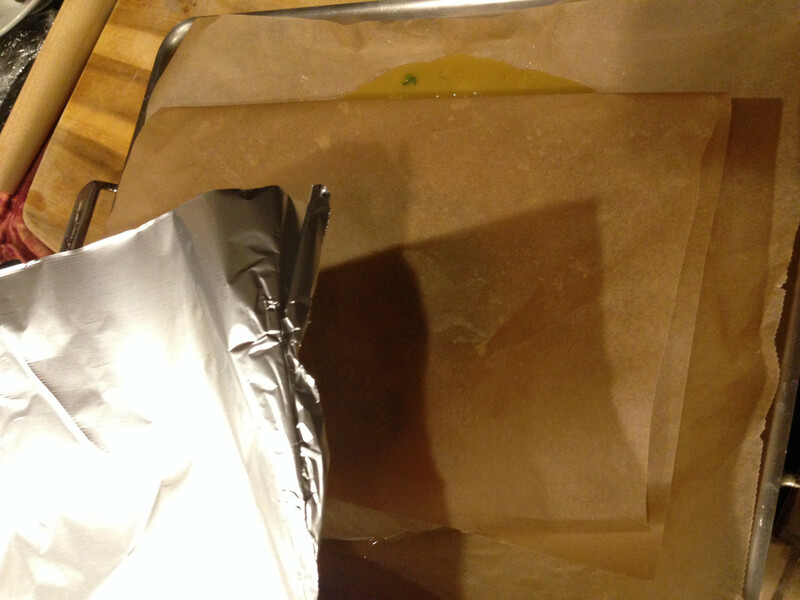 Lift your parchment paper, with your rolled out crust, and transfer onto a baking sheet. Spoon some of the liquid in the scallion mixture onto the crust and spread out using your fingers. 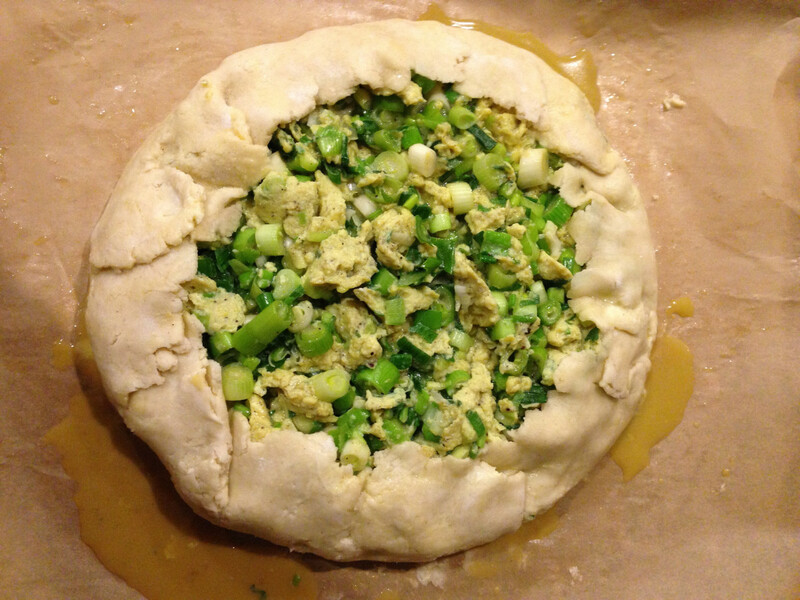 Then put all of the scallion egg mixture into the center of the crust and fold over the edges of the crust. Pinch and seal any broken pieces of dough. Note: There will be liquid (egg white) from the scallion mixture that will spread out when you add it all to the middle of the crust. That will evaporate in the oven and leave a hard, dark film on the edge that can easily be removed when cooled. 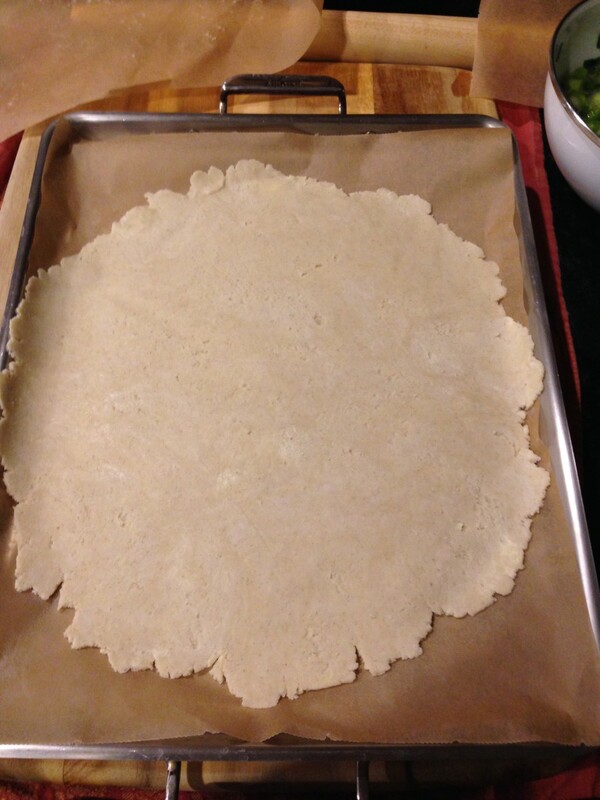 Take the other piece of parchment you used, fold it in half then cover the galette. 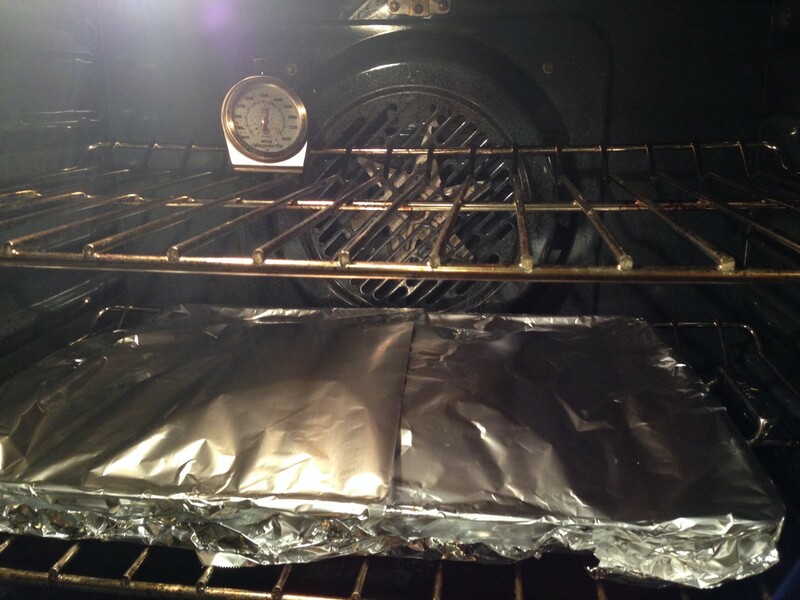 Then cover that with aluminum foil. Seal tightly. Bake for 15 minutes. Continue to bake uncovered 35-40 minutes, until the crust is golden brown. Note: I cover with parchment paper then aluminum to keep moisture in with steam and to make sure the galette doesn’t become dry, and the egg doesn’t burn before the crust is done. Let it cool 5 minutes before slicing. Serve hot. The four of us had some right out of the oven last night (hence the poor lighting), and then had some for breakfast, so I am not sure how long it can remain fresh after a day. 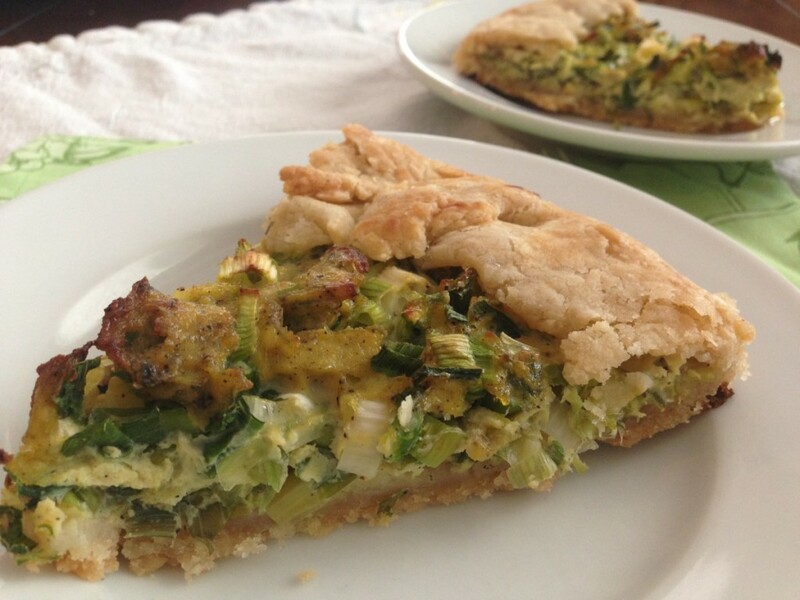 Have to show the light, flaky crust and sweet scallions in here … I think babula would enjoy this gluten free, dairy free one. That was a very touching story. You must have had a special relationship with your grandmother. The "piroshki" looks yummy. 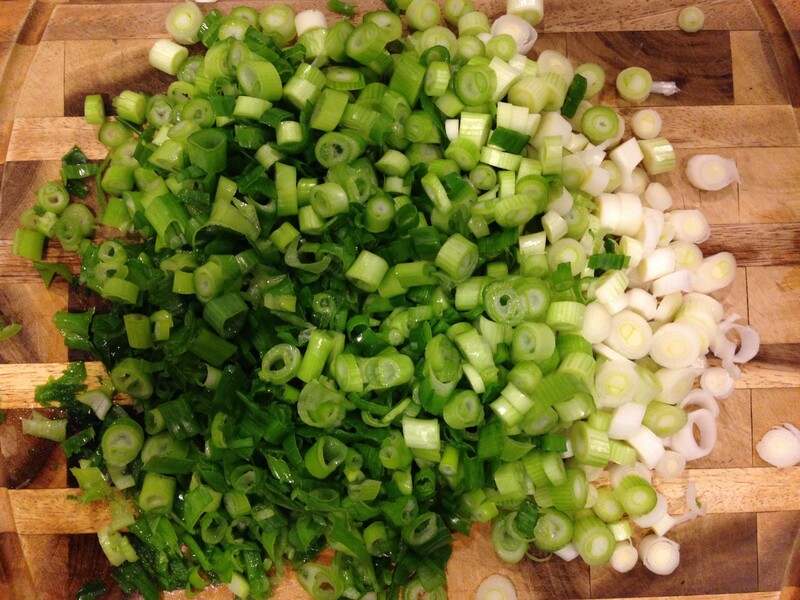 Have you used any other fillings besides the scallions? I can relate to your story. My grandmother was very special to me as well. Thank you for sharing her "gift" to you to all of us. The galette looks amazing and I can't wait to try it. Thanks for your recipe and sharing your story. Such a touching post in memory of your grandmother and think she would be thrilled with your adaptation of her recipe. I think I need to go through my late grandmothers recipe box. Thank you Cyndy. I wish I had a recipe box, you are lucky, a grandmother's recipe box is priceless! That made me cry thinking about my own Nanny. So touching to do this in memory of her. I am looking forward to trying this recipe. Thank you Yvette for your touching comment. This looks so enticing and simple, what grandmothers are all about. My grandmother from Poland who passed 8 years ago also made simple dishes like pierogi that were the best. So heartfelt of a post and brings back my own memories of my grandmother. God Bless. That was so touching to read. I am calling my nanny to tell her how much I love her. Thank you Leslie for your kind words. What a heartfelt story. I think it's awesome to commerate the ones we love. Food is the universal language and a wonderful way to express love. I'm wondering if I could use King Arthurs GF flour instead or will it affect the result? I have that on hand and would love to try this. Thanks Jessica. I am not too familiar with King Arthurs, on whether it has guar or xanthan gum. If not add 1/2 a teaspoon. Thanks for your comment Sylvia. OMG that was so touching! My Dad passed from lung cancer and I think of him always. He didn't cook but he was always looking for my fried chicken when he would come to my house for dinner. You going into the kitchen reminded me of my Dad craving my fried chicken. Food has a way of bringing people together and memories to hold on to. Thank you for sharing your fond memories Laura. What a wonderful tribute to our late grandma. Beautiful words Jessica. And an even more beautiful recipe! Can't wait to whip this up in the kitchen. Miss you terribly! Thanks Selena. Miss you too! Sending love to you all in Massachusetts! This looks so satisfying especially on the cold days we have been having in Seattle. It is so sweet to share your recipe and your memories. Why are mirrors covered? Sorry, just curious. This looks so delicious, and sharing your memories is so thoughful. It sounds like she was an inspiration to you. I would love to try this, and am wondering if the egg affects the filling? My husband and I are vegan. Can I add more onion? Thanks Jessica! Thank you Renee, she was. I don't think it would affect the filling since it is not used as a binder in this recipe, though I have not tried it. I would add extra scallions, and ground white chia seeds (2 teaspoons) mixed with about 1 tablespoon of oil. Let me know how it is if you do make it egg free. Enjoy! I'm kvelling right now. So touching to read! Your story is so moving and brings me back to the days when I would spent summers upsate NY with my grandparents. Family memories are dear to me too and think it's wonderful to honor your grandmother. This piroshki looks so enticing with a cup of soup. I would love to make this but only have Bob's Red Mill AP blend with the red label. Do they sell this at Whole Foods or Trader Joes? Or can I use my other flour? Thanks. Thank you Laura for your comment. Soup and piroshki sounds perfect! 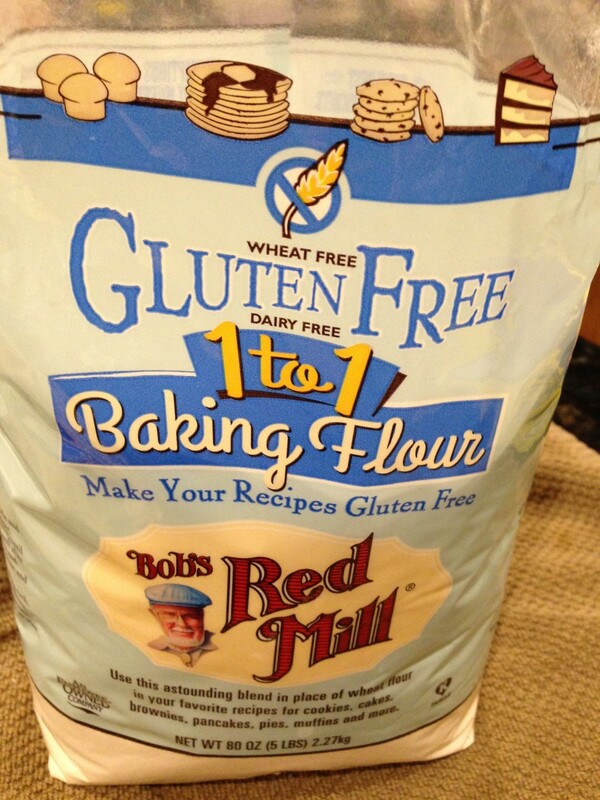 I think the other GF All Purpose by Bob's Red Mill would be fine, but am not sure if it will impart a bean flour taste. That is up to you. I bought mine at Sprouts Market near Los Angeles, not sure if you have a Sprouts in your area but you can certainly find it online. I remember my grandma would make speculaas cookies that would leave such a wonderful smell of spices. Your warm story brought back memories of my own grandma who passed 10 years ago. Fortunately I have the recipe and do make them often. Your piroshki looks delicious and the dough so flaky. A weekend treat! Thank you Harriet. I would love to try your grandmother's speculaas recipe! Would you mind sharing it with me? If so, please send me an email. 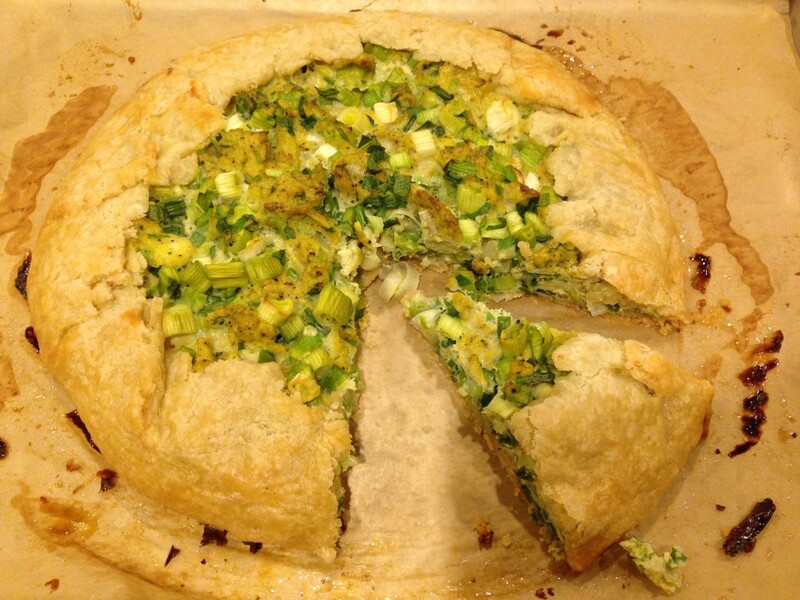 The memory you share of your late grandmother is so sweet, and the Scallion Egg galette looks like the galettes my mother would make, not gluten free either, she would make it with onions and peppers. This would be ideal to try. wow. thank you for sharing this story and this special recipe. made this and it came out perfectly. we all savored this piroshke (is that it?) although i forgot to dice the earth balance it seemed to be o.k. you shared a new dish, never made a russian dish before, and a wonderful story. cheers from dublin! 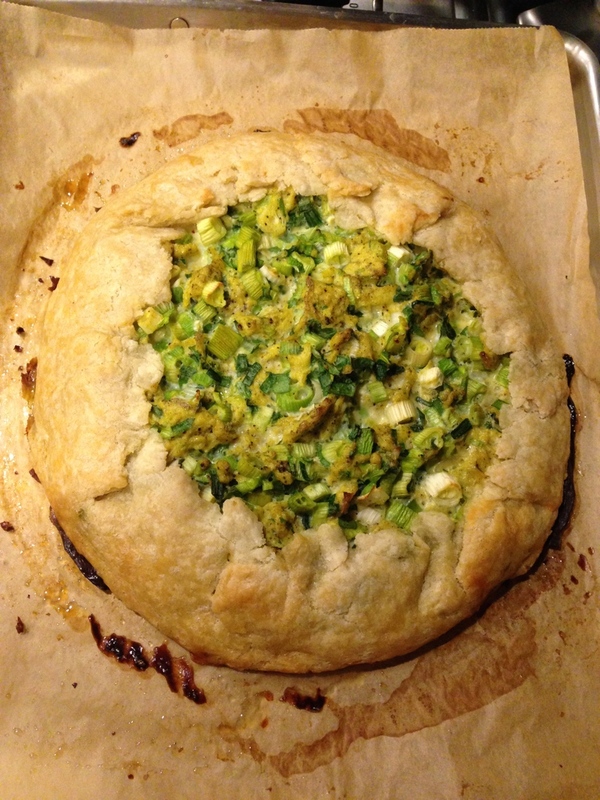 Decided to make this savory galette for breakfast today. I also added some ground sausage to it and it was incredible. Making the crust by hand gave us a superb flaky crust. Thank you for this recipe and sharing warm memories of your late grandmother. When I read your post a week ago I was touched by your story. Today I made your exquisite peroshki. They are unbelievable. My family couldn't stop telling me how delicious they are. Many thanks to your Grandma and you. You are both very special! Thank you Paula, you are so sweet and happy to hear everyone loved it :) It's one of my favorite things of all time. Thank you for the story and for the recipe. I have been reflecting on how many or perhaps even most of us do not realize how much our beloved elders could use our love and attention more than we might be doing. There is so much to life!! So many directions to put our attention on! We grow up experiencing their strength; we might forget or not realize how different they might be in their later years. Not as strong, not as capable, not as independent. We might not realize they're tracking everything or nearly everything we share with them. When next we visit, they ask us about the play our 6 year old was in-- 8 months ago. With all that you have to have your attention on, I can easily believe that your grandma--wherever she is now-- can appreciate and be proud of all you need to do in your everyday life. Just some random thoughts that came up as I scrolled down to thank you for this recipe. I look forward to trying the 'eggless' version you suggested, using Chia seeds and oil because I follow a Gluten Free Vegan diet. lots of hugs from the Hawaiian Rainforest. I think your grandmother would be proud. Easier than I thought and quite honestly more delicious than I expected for gluten-free and dairy free!! Thank you so much Anna for your kind words, I hope so, and am happy to hear you love the piroshki! Seemingly perfect for all the wind-chill going on around here! I can imagine sitting in the evening munching at this and the warmth and taste! Chilly food eats for sure, enjoy! 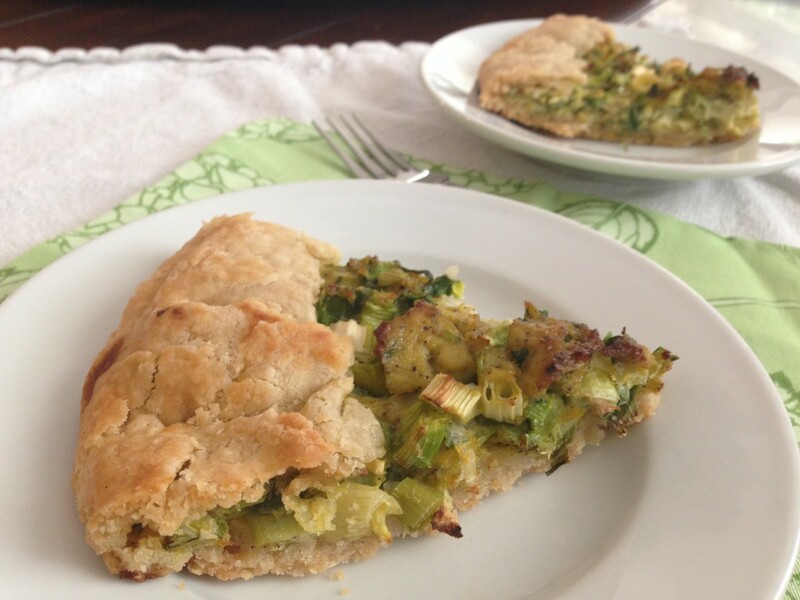 I love savory galettes and had to try your scallion version since finding it on pinterest. Since being diagnosed with celiac November 2015 I have been attempting to bake gf and still have it taste good. Your step by step photos were helpful and your recipe delicious. Hard to detinguish from a gluten dough as this was light and flaky like I remember 'real' dough to be. 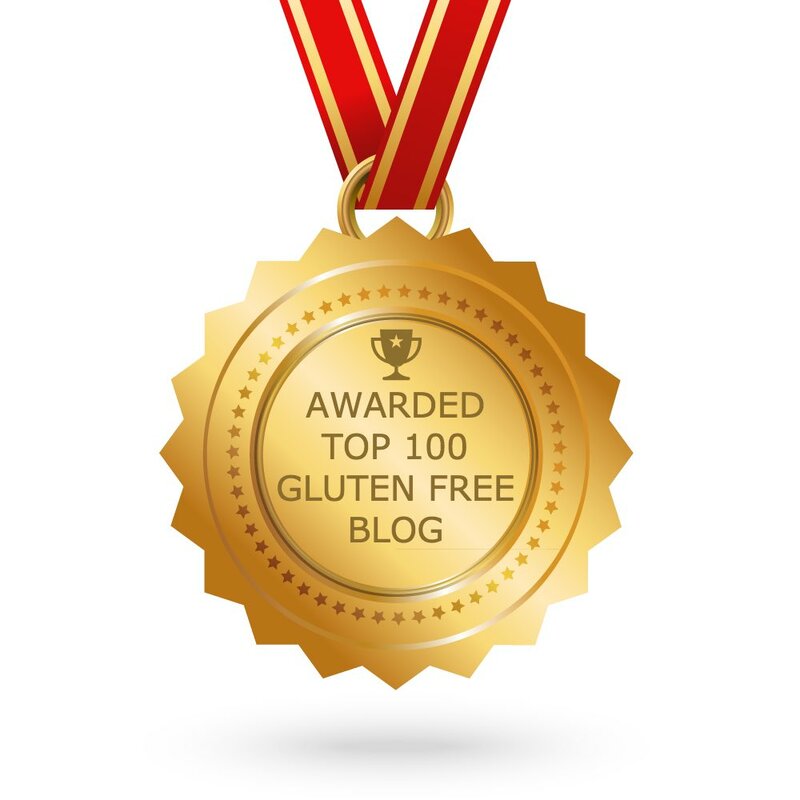 I'm happy to have found your blog with so many recipes. I'm now excited about baking again! There is this bakery in Seattle called Piroshky Piroshky that has THE BEST smell I've ever smelled. I'm not sure if this is similar but I couldn't try because I'm gluten free .... SO excited to try your recipe!! In Pike market, yes, I saw (or should say smelled) the place when I was in Seattle last year! I remember they didn't have anything gluten and dairy free so I went to the little bakery down the way that sells gluten free/vegan for a carb fix. This recipe is a baked open-faced version of piroshki. There are two types: the open-faced, like this one, and the yeasted, fried type where the filling is stuffed in the dough (think: calzone but smaller). My grandmother's was more oily (as all piroshki usually are), I went for less oil to make it a bit healthier. I hope you love it as much as we do...enjoy!